The posterior aspect of Gerota's fascia is incised transversely at the level of the upper pole of the kidney (Fig. 6). The aim of the ensuing dissection is to circumferentially mobilize the upper pole and mid-region of the kidney and the covering Gerota's fascia. The upper pole is now dropped posteriorly onto the psoas muscle away from the adrenal gland. This dissection proceeds immediately adjacent to the parenchyma of the upper pole of the kidney. 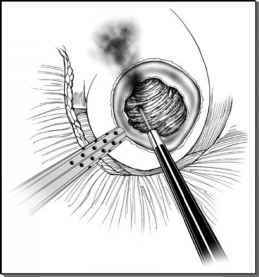 Care must be taken not to injure any accessory vessel entering the upper pole of the kidney. At this juncture, the unmobilized adrenal gland is still located in its normal position, attached anteriorly to the parietal peritoneum. Careful blunt and sharp dissection is performed toward the renal hilum, between the upper pole of the kidney posterolaterally and the adrenal anteromedially. The caudal limit of this dissection is the renal hilar vessels, usually, the superior branch of the renal artery. Multiple small renal hilar vessels supplying the adrenal gland are encountered in this location, which are securely clipped and divided. Dissection is now transversely continued medially along the renal vein or artery, and the main left adrenal vein may be identified (Fig. 7A) at this juncture and clipped (5 mm clips) and transected. If the main left adrenal vein cannot be identified at this stage, dissection is redirected toward the undersurface of the diaphragm. The adrenal gland is mobilized along its cephalad aspect, controlling the inferior phrenic branches. Multiple aortic branches to the adrenal gland may need to be controlled in this area. Continued dissection along the medial and inferomedial aspect of the adrenal gland will identify the main left adrenal vein as its sole remaining attachment. The left adrenal vein is longer than the right, arises from the inferomedial aspect of the left adrenal gland, and courses obliquely in an inferomedial direction to drain into the proximal left renal vein. The vein is then clipped and transected (Fig. 7B). The right main adrenal vein is shorter, horizontally located along the superomedial edge of the adrenal gland, and drains directly into the inferior vena cava. Dissection is carried cephalad along the lateral aspect of the inferior vena cava, between it and the adrenal gland, until the right adrenal vein is seen, circumferentially mobilized, clipped, and divided (Fig. 8). The adrenal gland is then mobilized from the undersurface of the diaphragm. The main right adrenal vein usually arises from the superomedial aspect of the right adrenal gland. Although multiple small renal hilar arteries and veins enter the adrenal gland along its inferior and inferomedial edge, the larger, more well-defined main right adrenal vein usually resides in a more cephalad location, beneath and along the posterior edge of the right lobe of the liver. FIGURE 6 ■ Transverse incision in Gerota's fascia, with the aim of separating the upper renal pole from adrenal gland. FIGURE 7 ■ (A) Left adrenalectomy: Dissection proceeds caudally immediately adjacent to parenchymal surface of medial aspect of upper pole of left kidney, which is retracted posterolaterally (curved arrows). Adrenal gland, surrounded by periadrenal fat, is retracted superomedially (straight arrow). Caudal endpoint of this dissection is renal hilar vessels. Main left adrenal vein may or may not be visible at this point in dissection. Curved broken line indicates subsequent plane of mobilization of adrenal gland from the undersurface of the diaphragm. (B) Left adrenalectomy: Control of main adrenal vein. Upper pole of left kidney has been dropped posteriorly onto psoas muscle. Adrenal gland has now been circumferentially freed. Main adrenal vein, arising from inferomedial aspect of left adrenal gland, is now clip ligated (5 mm clips) and divided.